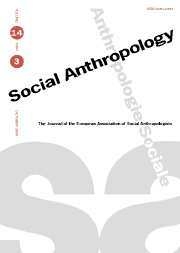 Social Anthropology is an international journal that serves the needs of all scholars with an interest in social anthropology. Not only does it publish some of the best scholarship available, but it acts as a forum for debate about key issues and concepts in the field, challenging and re-examining the boundaries of the discipline. As well as original research articles, the journal includes critical notes and a substantial book review section.